Pianist Joseph Akins was not born in Tennessee, but he got there as soon as he could. You can usually find him in Nashville, Tennessee teaching recording and production at Middle Tennessee State University, teaching piano, collaborating with his talented wife and New Age performer, Unita, or even adding his talent to performers at the Grand Ole Opry. Many times he plays live at local events and at Whispering Piano Concerts with all the big names. Fortunately, for us he is a big name, too. I have known Joey for about six or seven years now and I have met few performers who put more heart and soul into their composing and performing and who are more self-effacing. His solo piano music is mostly contemporary, but he sneaks in a jazz or New Age song from time to time. His new album, A Southern Sun, his fifth effort, is fourteen tunes of idyllic life in Tennessee and seems to span the seasons, delve into daydreams, and praise the everyday miracles of life. Growing up in the Northeast, I can identify with Akins affinity for the south. There's a beauty about slow talking, sweet tea drinking, church-going people that knows no bounds when it comes to friendship and charity. Joey's title tune, A Southern Sun, the first one in the cue I might add, has a musical drawl all of its own. His music took me down the red clay back roads and into the hollers. Then it coaxed me back into the city and allowed me revel in the beauty of the towering skyline. Where I was led, the sun beamed down like an old friend. Dancing on the Sea has a Vince Gurardi mode to it, bouncy and full of life. Okay, I admit that Joey lives almost five hundred miles from the Atlantic coast, but his imagination is far reaching. Let us not forget that a sea can be made up of more than just salty water. There are seas made up of grasses. Remember those amber waves of grain? But then there is the most glorified, a sea of love. Joey injects happiness and joy de vivre in every note on this uplifting melody. Imagine a trip into the deep woods. It is a warm summer day, dappled sunshine peaks through the canopy of maple and oak leaves from above. As I meander along I look up and there they are. A big bunch of bronzy grapes hiding among fan-like leaves just waiting for someone to pick them. The tune called Muscadine is a drowsy, playful tune. As the song progresses it sounds something like a rendezvous. Perhaps we can discuss it over a glass of wine? Winter is Coming has a bit of starkness to it, but it is not a cruel gesture. Just a reminder that falling leaves and cool afternoons are here. The ominous opening notes sound like a westerly wind blowing the crunchy leaves underfoot from the sidewalk. As I saunter along Second Street, the petals drop from the fall mums planted in the street boxes. The buildings tower above me, channeling the cold. Akins put a lot on musical imagery in this music. One of my favorites on A Southern Sun is a tune called Theme from a Dream. There is something organic and earthy about the music. This is no stage production. The first time I heard it I imagined a dancer twirling and leaping through the forest, perhaps the ballet of a nymph. The light is provided by fireflies, the music by the wind rushing through the trees and Joey's sensual piano. The final cut on the album, Watertank Hill is a sort of trademark of Joey’s as he sometimes puts a song that has nothing to do with the theme. This time however it has everything to do with the theme. The lighthearted folksy tune might have been lifted from the Floyd Cramer songbook. There is nothing more southern than the big silver water tank that guards every town in Tennessee. It is the victim of spray paint and lightening in equal doses, but it is often the first landmark you see when you return from the big city. It is the visage that makes your heart go "Ahhhhh, I'm home". 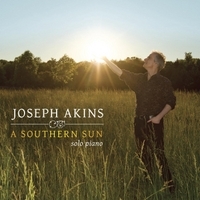 I have reviewed most of Joseph Akins albums, but this has more depth and refinement. There is a little more thought and more polish to the tunes and it is lucky for us. When you watch Akins play in person, you can see he appreciates his audience first and foremost. This album is for the fans.